The deluge of trailers for 2017’s biggest tentpoles shows no sign of letting up anytime soon what with Trailer Track reporting that the first footage from Andy Muschietti’s It movie ought to be online later this week. Pointing to a listing from Deluxe Digital, it’s understood North American cinema chains will screen the trailer alongside Ghost in the Shell, with advanced screenings of Paramount’s lavish manga adaptation kicking off from Wednesday, March 28th. Expect the promo to make its way online soon thereafter, then, and at least based on the wave of reactions that surfaced from SXSW 2017 – the Austin festival hosted the first reel of footage for Muschietti’s ambitious redo – horror fans are in for a delightful R-rated treat. Of course, those familiar with Stephen King’s iconic source material will know that it’s Pennywise the Clown, the demonic being to be played by Bill Skarsgård, that brings the supernatural horror to the quaint town of Derry, Maine. His presence is enough to place the Losers Club on red alert, and it’s up to that core cast of misfits and outcasts to get to the bottom of the murder mystery and, ultimately, banish Skarsgård’s entity once and for all. Tim Curry brought the menace to life almost two decades ago to great effect, so more than anything else, we’re intrigued to see how Skarsgård’s portrayal pans out. Pennywise the Clown will stalk Derry, Maine – and our nightmares! – when New Line’s It movie opens on September 8th. 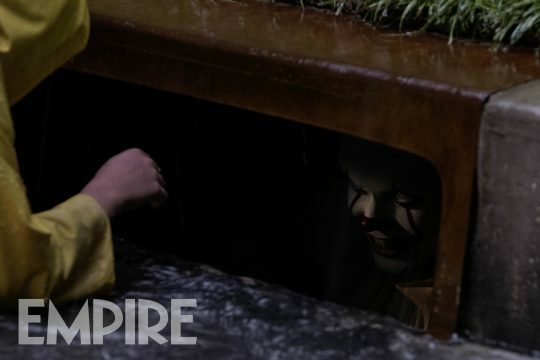 Despite some back-and-forth early on in development, both the studio and Andy Muschietti are still game for a second, conclusive chapter in the Pennywise saga that will see the Losers Club confront the transdimensional clown years after the fact.